We carry some of the best hair, skin, body and nail lines in the world, ask us any questions about them! As an Authorized Vendor of the products we carry, we are dedicated to offering you only the freshest product. In an effort to bring awareness to our clients, and to ensure you are purchasing only authorized product, consumers need to be aware that if they purchase from such institutions as eBay or Amazon, or unlicensed skincare or haircare professionals, their product may be diluted, expired or counterfeit. Such product is considered to be "diverted" and may not be safe to use or perform as tested and may not have the backing of corporate in the event of an issue. We carry enough of a variety so we really do have something for just about everybody. Whatever your concern - vegan, gluten free, a small footprint, scientific superiority, ability to customize, great fragrances, great prices - we can find something that you will love! Hair Care Lines: Loma, Redken, Soma, Kenra and selected Paul Mitchell and Eufora. A Favorite! We love Alterna products. They keep your hair healthy from the inside out. Keeping it looking young and fresh, always. The Alterna Caviar line is amazing, we sell out of our shipments everytime! All formulas of lotion contain pure hemp seed oil and extract, a rich source of essential amino acids and nutrients vital to keratin formation, the principal protein responsible for healthier, smoother skin. Vitamins, proteins, anti-oxidants and botanical extracts provide added nourishment, protection and softness. Beautiful makeup for a beautiful you! All the tried and true classic colors as well as season fun colors to give you a perk just when you need it! Aromatherapy-based, natural, and paraben-free, Tu'eL™ is manufactured in the U.S. 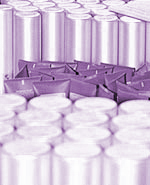 Ongoing research guarantees you the latest in cosmetic chemistry. This skin care system is formulated for all skin types - regardless of gender, ethnicity, or condition. Tu'eL™ is a comprehensive professional line that leaves the skin balanced and smooth. Starting with hydrophilic oils and herbal extracts, the advanced cleansing systems are complemented by creams, masks, serums, sun protection, and synergy blend essential oils. This unique method of cleansing with oils also eliminates the need for astringents or toners. This line is definitely 'the bomb' when it comes to haircare for those of us that are thirtysomething plus...you will immediately notice shine and vitality in your hair. This line is fabulous on all types of hair except for the very fine (a little too much conditioning for you!) we guarantee you will love it! A fabulous makeup that really does care for your skin, especially skin over the age of 30. Come in and try some, you will be impressed. These pedicure products smell good enough to eat! You will definately want to take some of them home to duplicate your Spa experience again - the scrub is great in the shower, and then drench your skin with the lotion when you get out - bliss! Gylsolid is a great product for healing dry cracked heels. It is a must have after a pedicure to keep your feet in great condition and nicely moisturized year round! Best mascara around! This mascara is different in that it puts tubes around your lashes, giving you both volume and length. This mascara is truly revolutionary! It stays fresh looking all day, yet washes off so easily with just water. You'll never go back to regular mascara after you try Kiss Me Mascara! We carry the Nail Tek formulations to help strengthen your nails. We have the entire program available for purchase in the salon. If you have weak nails or brittle, thin nails, Nail Tek will work for you! 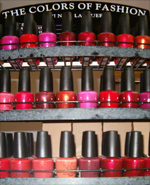 We carry a vast selection OPI colors and nail products. We have many of their collections, including the European collection, the Las Vegas collection, the British collection, the Classic collection and the Holiday on Broadway collection! We carry a selection of the most popular mousses and sprays. Paul Mitchell styling products have stood the test of time in professional hair care. Their Mousse is one of the most popular items that we carry, it's a classic! Great products! We carry the entire line of Redken products. They have something for everyone, and the best thing is that they actually do what they say! No empty promises when it comes to Redken, just professional quality all of the time! How very uniquely you! Finally, a fabulous line that we can custom blend to work for you, because we know your skin is not like anyone else's skin out there. Come and try the custom blending in our facial treatments, as well as your take-home products, we promise you'll be impressed. We carry Blinc's Kiss Me Mascara- of course!! We also have the Blinc Mascara Primer, which enhances lashes length and thickness before putting the Kiss Me mascara on. A must-have for those of us with wimpy lashes... We also carry Blinc's eyelash curlers, which are the size of a mascara tube, but have amazing ' heated ' curling power! 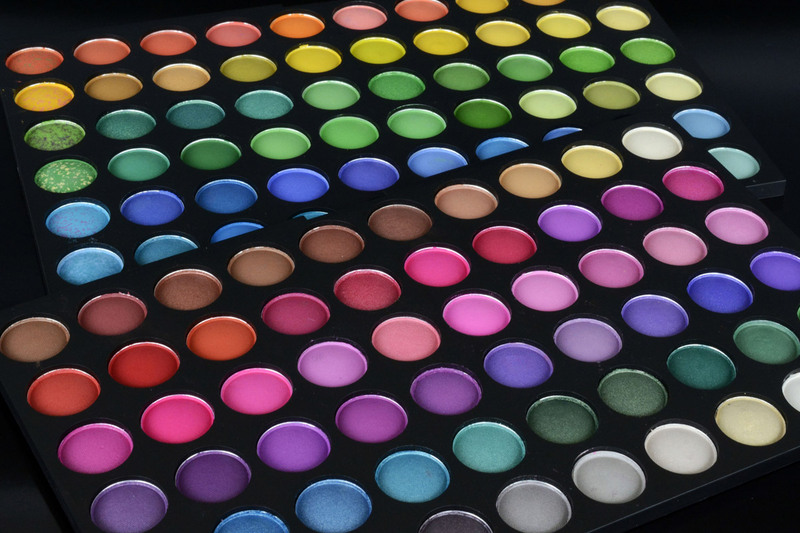 Many of our Nail products are from Creative. 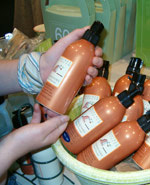 We carry a variety of their nail polishes, as well as their popular Solar Butter line. Creative nail products are fresh and fun...and best of all they allow you to be...creative!! Gena products are wonderful! 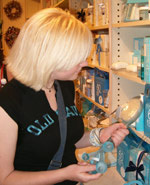 We carry an assortment of pedicure masks, gels and cooling sprays for your feet, all made by Gena.